The stage is finally set for our open weekend on August 1st and 2nd. Any changes I make from now on will appear too obvious, so it’s simply a case of deadheading, sweeping and watering to maintain the status quo. 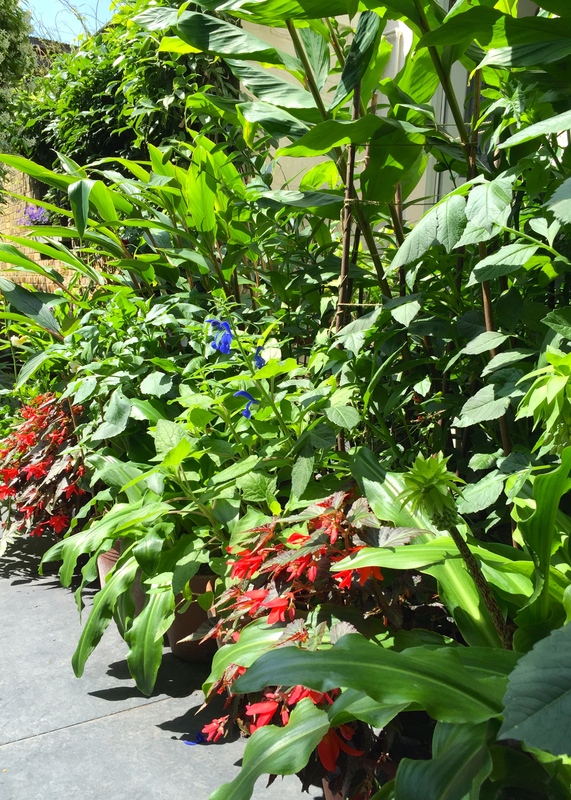 The pressure is now on the cast – the dahlias, gingers, agapanthus and fuchsias – to remember their lines and put on a memorable show. The company that makes up our seaside garden may be small, but there is always room for new cast members. I should operate a one-in, one-out policy, but this normally works out as two-in, one-out. Winter does a good casting job for me, weeding out plants that are too demanding and promoting others to lead roles, but I have become increasingly intolerant of anything that just plods along without ever shining. In a confined space, every plant needs to work doubly hard. So out has gone Dianella tasmanica, which was wonderful for a couple of years before looking dreary and unhappy for the last five. Requiring something with lance-like foliage in its place, I acquired three plants of Crocosmia ‘Hellfire’ from Madrona Nursery last weekend. Planted in our raised borders the vermillion flowers are already looking ten times better than the Tasmanian flax lily ever did, although I shall miss its evergreen foliage. Nearby, Euphorbia mellifera was simply too large for the garden, even with regular pruning (which it disliked), and its departure has made way for lots of new treasures. 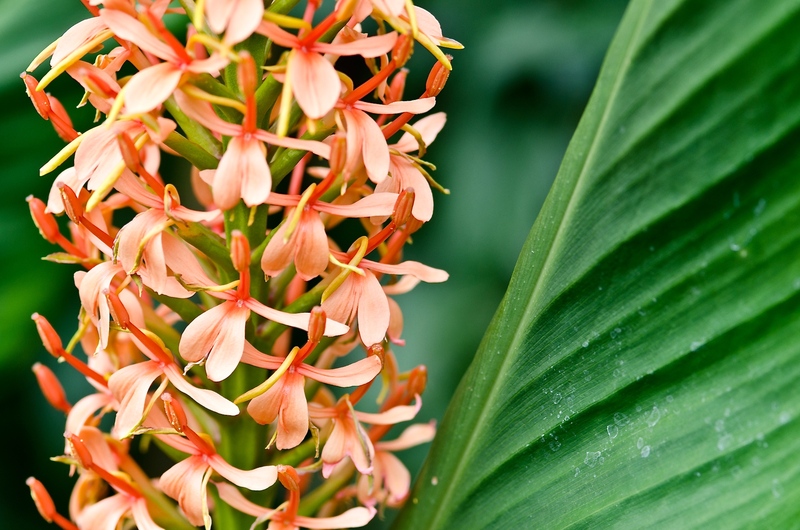 This week I recruited three cracking new starlets from Jungle Seeds: Hedychium yunnanense, Hedychium densiflorum ‘Sorung’ and Colocasia esculenta ‘Illustris’. 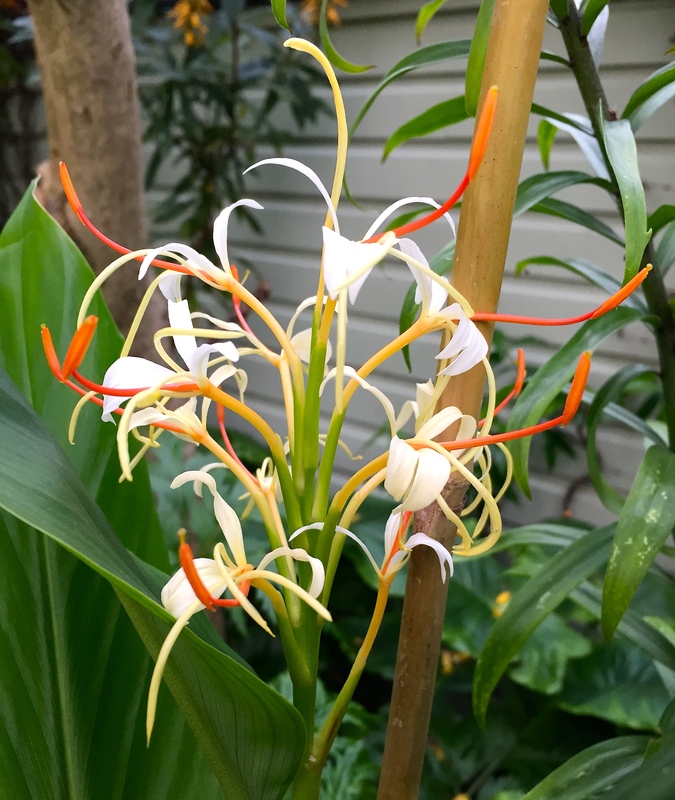 They arrived in splendid condition and I was delighted to find Hedychium yunnanense blooming straight out of the box. The perfume of the flowers after nightfall is sensational: the moths are in for a treat. 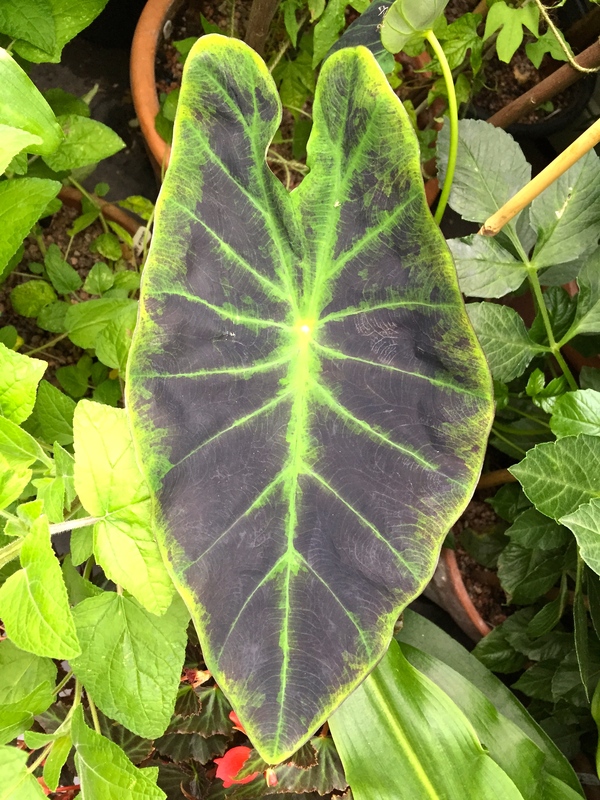 The last newbie is Colocasia esculenta ‘Illustris’, a plant with designs on stardom. Also know as taro, Colocasias are foliage plants which can end the summer with leaves 3ft long. It’s unlikely mine will reach those proportions this year, but even at 1ft long the leaves are quite stunning. They will bring new shape and texture to the row of pots near the front door. Colocasias like to be moist but not wet and have display better leaf colour in semi-shade, so regular watering will be needed. It would be nice to think I could now take my front row seat and get ready for the show, but no such luck. There are posters to put up, guest rooms to prepare and catering supplies to buy in, not to mention serving ice cream in the interval. Now that the stage is set I feel a great deal more content, let’s just hope storm and pestilence don’t bring down the curtain before it’s even been raised! Oh good luck, I will be there in spirit. Ditto. I want it, Will have to reserve some winter space in my shed for it , I assime it is not hardy. Not quite so balmy on my hillside garden over here in the High Weald. Will look out for your open day, all the best. Excellent blog, really enjoying it. I believe a lot of gingers are hardy provided they get a thick mulch. However, they are easily stored in a shed, garage or cellar as they don’t need to photosynthesise over winter. Get them out into a warm spot as soon as you can in spring to encourage regrowth. I am very brutal with mine and they seem unphased. When they start bursting out of a pot then it’s time to upsize, but not before! Now you’ve got me wanting to watch All About Eve again for the zillionth time. Break a leg! 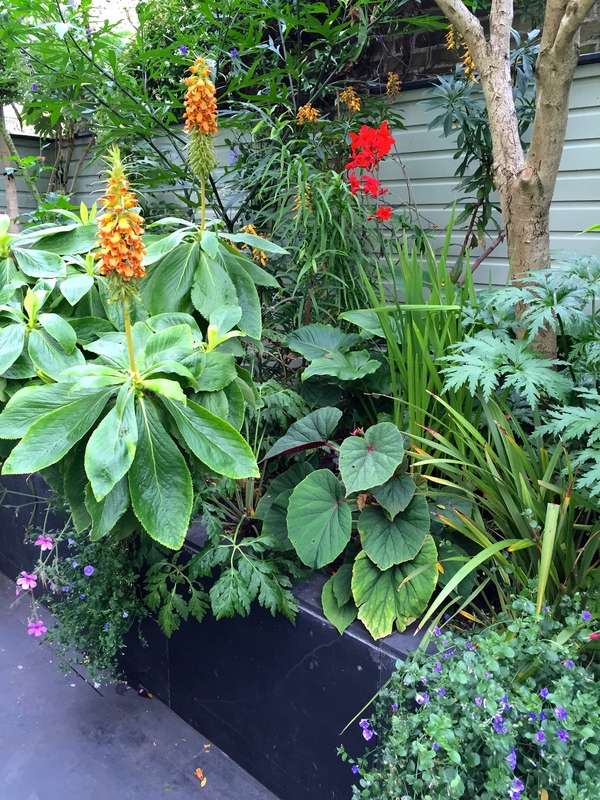 The garden looks absolutely gorgeous – you must have worked very hard indeed! I found the Madrona Nursery a while ago – fascinating place. You could have cut the ribbon Gill! I’ll put you down for next year, if I survive this one 😉 I have just taken delivery of a tea urn so I feel I have arrived …. not sure where. I just adore this garden. Wish I could come and visit! Thank you Janna. Perhaps one day! Am reading Phillip Johnson’s book at the moment and now I want a billabong and some enormous boulders!! The photos in that book are amazing, aren’t they? Highly inspiring. You’ll pick up the funny ‘the English do this’ comments, that are slightly obscure, but the photos all make up for it. Hard to believe that this is in England. It is so exotic!